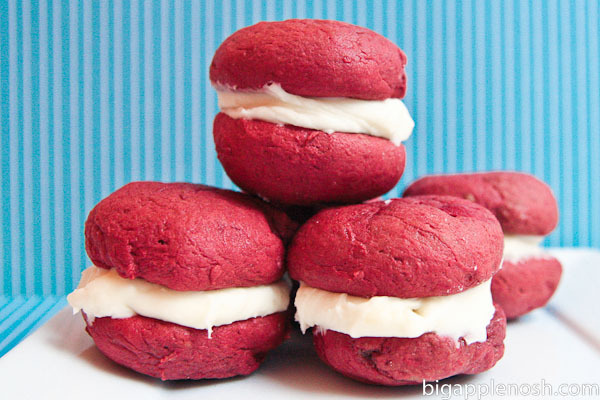 So I had made red velvet whoopie pies a while ago (before the days of this blog), and thought in the spirit of Valentine’s Day and red and desserts and all that, I’d give it another go. Now who of you guys are red velvet fans? Raise those hands high! I love whoopie pies because in addition to the fun to say name (Whoopie pie. Say it, you won’t regret it), they are super easy to make, look cute, and combine two favorite food categories – sandwiches and desserts. The mom of one of my former classmates is actually Pennsylvania Amish (where these lil’ pies originated) and I’ve been dying to get her recipe – the ones I made last time were AWESOME (if I do say so myself, haha) but required a lot of tweaking and substitution on my part to get them exactly how I wanted. I promise once I have the exact recipe nailed down, I’ll post it. However, in the mean time, this one from Better Homes & Gardens had to do (I do sub in cream cheese filling though). So let’s jump right in, shall we? This recipe makes 21 2-inch pies. (NoshGirl Note: No it doesn’t! I stretched mine out and only got to 15. In the land of desserts, that’s a major travesty. Boo BH&G). 1. 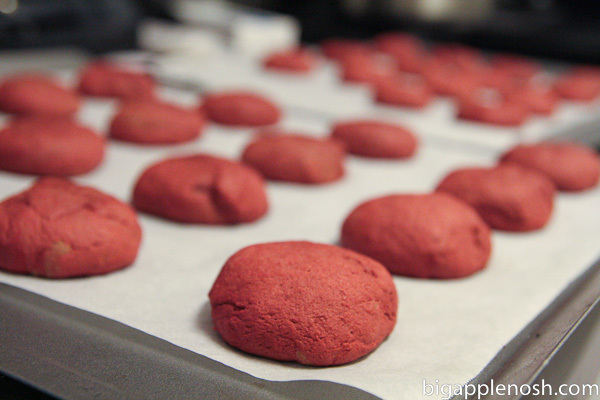 Preheat oven to 375 degrees F. Line baking sheets with parchment; set aside. 2. 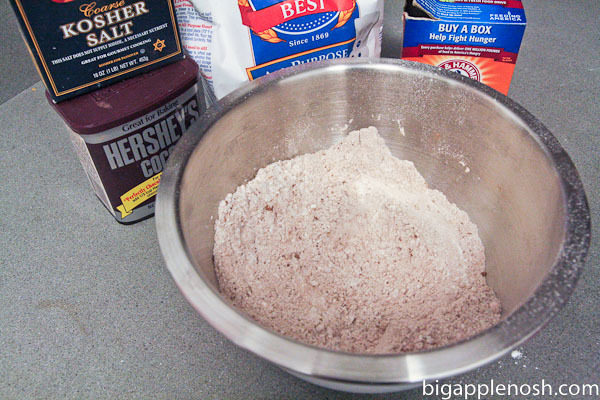 In medium bowl combine flour, cocoa powder, baking soda, and salt; set aside. I know, isn’t this picture soooo exciting? You’re on the edge of your seats, I can feel it. 3. 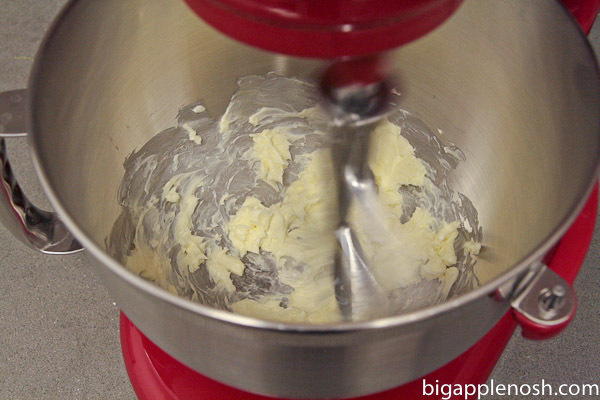 In large mixing bowl beat butter on medium to high 30 seconds. 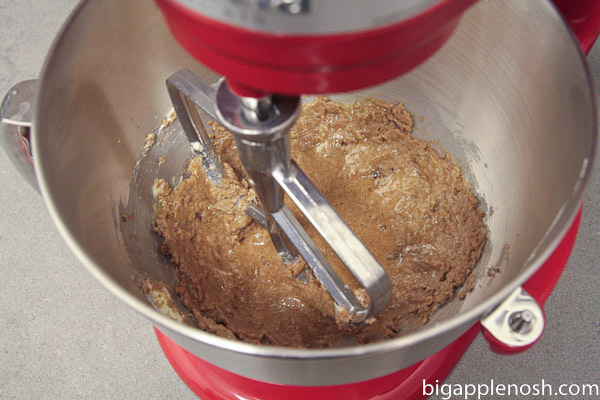 Beat in brown sugar until light and fluffy. Beat in egg and vanilla. 4. 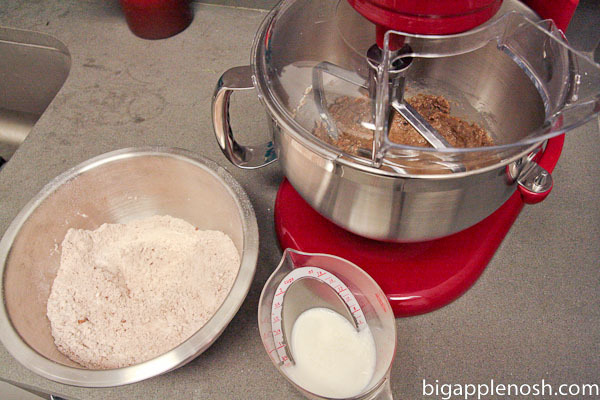 Alternately add flour mixture and buttermilk, beating after each addition just until combined. Stir in food coloring. 5. Spoon batter in 1- or 2-inch diameter rounds, about 1/2-inch high on prepared baking sheets, allowing 1 inch between each round. 6. 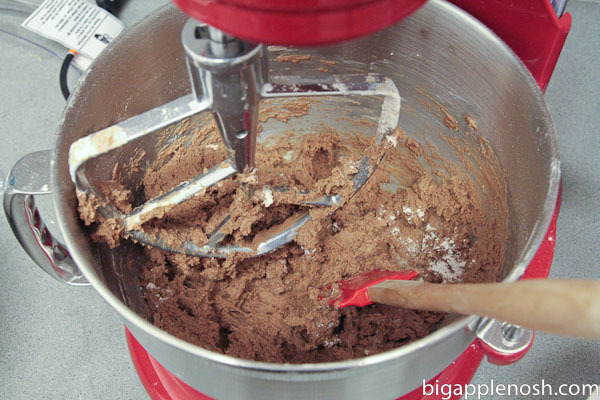 Bake 7 to 9 minutes for 1-inch cookies or 9 to 11 minutes for 2-inch cookies, or until tops are set. Cool completely on baking sheets on rack. 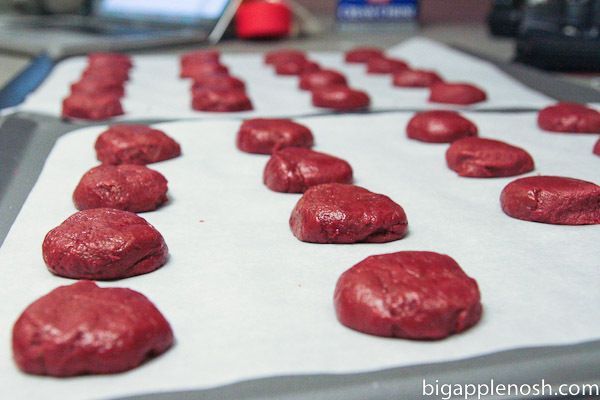 Remove cooled cookies from baking sheets. 7. 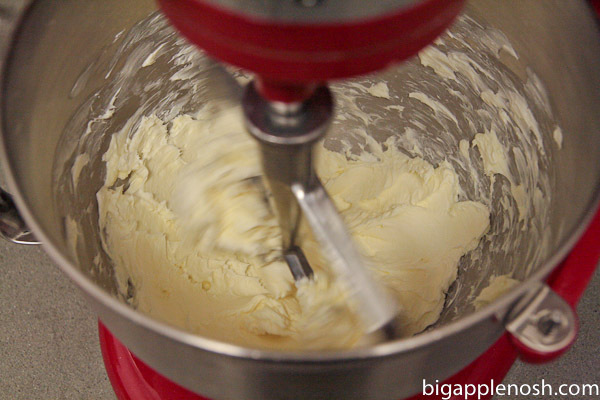 With an electric mixer, cream together cream cheese and butter. Add vanilla extract and combine. 8. 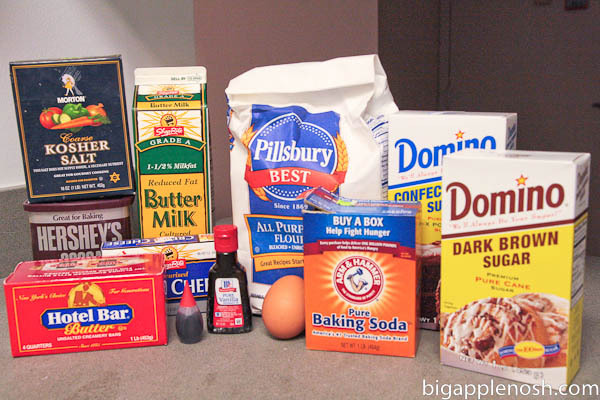 Gradually add confectioners’ sugar until you reach your desired consistency. Once the pies are completely cooled, assemble and you’re good to go! Whoopie pie fan? Yay or nay? I've actually NEVER had a whoopie pie. Me thinks I should change that soon! 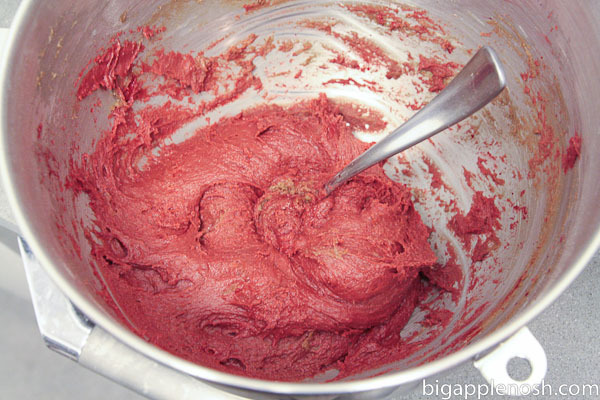 i love red velvet because it's usually accompanied by cream cheese frosting. red velvet red velvet, send yourselves right on over. I need to try red velvet! I see it every where and I dont think ive tried it yet! 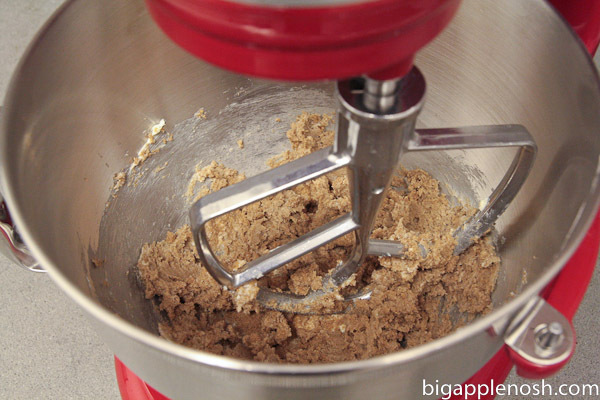 Awesome – for those of you who try this recipe, let me know how it goes! 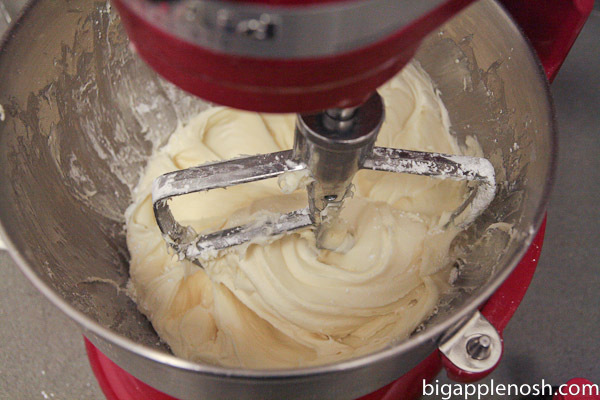 Yum and cream cheese frosting is the best – don't sub it out! So pretty…and the cream cheese frosting needs to stay!